Will buying Tidal help Apple fend off Spotify? Apple may be looking to play both offense and defense in the highly competitive world of digital music. The maker of iEverything is reportedly in talks to buy streaming music company Tidal, a service favored by many artists that is run by rap megastar (and Beyoncé hubby) Jay Z. At the same time, rival music streaming service Spotify is said to be miffed at Apple (AAPL) for not agreeing to an update of the Spotify app in the App Store. Recode reported that Spotify's general counsel recently sent a harshly worded letter to Apple, accusing it of "causing grave harm to Spotify and its customers." According to the Recode report, Spotify also said in the letter that "Apple uses the App Store approval process as a weapon to harm competitors." Apple shot back, though. BuzzFeed reported Friday that Apple general counsel Bruce Sewell sent a rebuke to Spotify, arguing there was nothing it was doing that violated antitrust laws. Sewell also pointed out that Spotify has "benefited enormously" from being part of the App Store, and that Apple was "disappointed with the public attacks." Apple, Tidal and Spotify were not immediately available for comment about the reports. So what to make of all this drama? First, the Tidal talk. 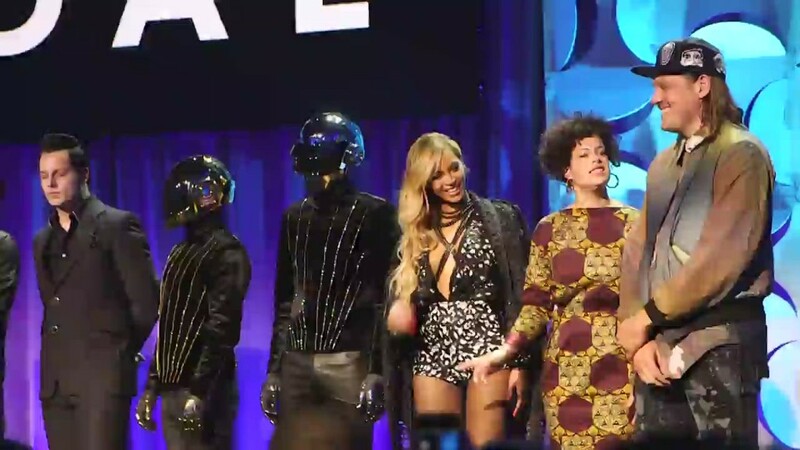 It's not out of the question to think that Apple would be interested in Tidal. And Apple Music still is trailing Spotify. Apple CEO Tim Cook said during the company's last earnings conference call in April that the service had 13 million paid subscribers. But Spotify CEO Daniel Ek proudly tweeted in March that his company just passed the 30 million subscriber mark..
Spotify continues to add subscribers despite the threat from Apple. But competition for the earbuds of music fans is intense. There's also iHeartMedia (IHRT) -- the oddly named digital and terrestrial radio company formerly known as Clear Channel. Spotify is a juggernaut that can't be underestimated. The privately held Sweden-based company is a so-called unicorn, with a most recent valuation just north of $8.5 billion. Related: Change the channel on Pandora? But that pales in comparison to Apple -- the most valuable company in America with a market cap of more than $525 billion. That's what makes the reports of Spotify being miffed at Apple so interesting. Spotify needs Apple of course, but the company is also trying to lessen its reliance on the iPhone maker for new signups. Spotify recently published a message on its web site to explain why it costs more to subscribe for Spotify via iTunes and the App Store than it does directly through Spotify. And Spotify urged its users to renew directly with Spotify, complete with a 3-step list of how to do so. "The good news is you don't have to pay extra: Paying for Spotify through Spotify.com instead means you're cutting out the pricey middleman and coming directly to us," the company said. This battle is just beginning. Expect Apple to fight back. A deal to buy Tidal could be just the first shot. Music is one area where Apple has the potential to report stronger sales. It's clear that Apple needs more areas of growth now that the iPhone is starting to show signs of maturing. Wall Street is no longer in love with Apple. The stock is down 8% this year -- after finishing in the red in 2015. That's despite the fact that Apple is still rewarding shareholders with stock buybacks and a big dividend. The problem is that Apple's long-term growth potential is now in question. To quote Apple enemy turned friend Taylor Swift ... "You give me everything and nothing."